Spencer here: This week has been remarkable. Billy and I took some time to chase down a fabulous partial eclipse. As soon as we got out of “town” I felt a weight off my shoulders. I could feel the blood pumping back into my heart and hands. Most of the camping gear remains stowed in the Jeep, so we basically hopped in and peeled out! We took I-84 east towards the John Day River. Billy had researched the weather patterns across the state for the day and somewhere in eastern Oregon it was said to be partly cloudy…that was the best we could hope for as the wind, rain and blanket of clouds are back for the duration of winter. After a sweet jaunt down a two-lane called 97, we came upon some small towns and eventually the Cottonwood Canyon State Park. It is one of the newest parks in Oregon, and though it is a beautiful canyon, the campground is sparse. It was too cloudy to get a good look at the sun, through our eclipse glasses, so we headed back west and followed the movement of the clouds. Taking a break in Sun Rise Cemetery, outside of Wasco, for lunch, was a really calming, thoughtful, yet chilly endeavor. (I like how the sign to the cemetery divided and capitalized both “sun” and “rise”). At first, I wasn’t sure if the “locals” would really appreciate us hanging around their dead elders, but actually I find cemeteries are quiet, peaceful places to be present. I have always liked hanging out in them. Just then, the clouds parted a bit and we caught a teasing glimpse of the eclipse. I managed to get a look on the side of the road, but this picture was more intriguing. I viewed the moon sliding over the sun through milky cloud cover. We finished our snack and decided to head further west down a lovely road called 206. The sun finally broke and came out in full force at the Deschutes River Recreation Area. The air felt warm and we got a grand look. Billy noticed the sun had a sunspot, and sure enough, the headlines the next day said the sunspot was one of the biggest in 20 years. Back at the Cottonwood Canyon Campground, we set up in a little open site, had dinner and a nice little warming fire. I told Billy more about the dream I had had the night before. One of the most exciting things about the sky for me is the reminder that we are just travelers in space, all the time. Our stories are small really, in the grand scheme of things. When things start to feel tight and hurried, stressful, even scary, we can just look up and remember there is a whole universe of wild animals out there, evolving just like us on planets beyond our imagination. One of my favorite accounts of an eclipse ever is recorded in Annie Dillard’s Teaching a Stone to Talk. An inspiring story about astronaut Samantha Cristoforetti can be read here: about the Futura mission. Samantha, who will be prime operator of the largest support vehicle docked on the International Space Station, will be up in space for six months maintaining the microgravity laboratory. One of her tasks: to educate children about nutrition and the food cycle via the recycling of carbon dioxide. Here’s to women taking the lead on the final frontier! Chasing the eclipse across the Cascades was an adventure I needed. It is good to get out into the wilderness often for me, outside of our controlled environment that is the city. I remember old things: to sit by the fire and watch for meteors, talk to plants, listen to plants, listen to the river, watch for bighorn sheep and to remember to breathe. To sit with the people that we love and witness them for who they are and appreciate their beauty. What else is there to say? At once this disk of sky slid over the sun like a lid. The sky snapped over the sun like a lens cover. The hatch in the brain slammed. Abruptly it was dark night, on the land and in the sky. In the night sky was a tiny ring of light. The hole where the sun belongs is very small. A thin ring of light marked its place. There was no sound. The eyes dried, the arteries drained, the lungs hushed. There was no world. We were the world’s dead people rotating and orbiting around and around, embedded in the planet’s crust, while the earth rolled down. Our minds were light years distant, forgetful of almost everything. Only an extraordinary act of will could recall to us our former, living selves and our contexts in matter and time. We had, it seems, loved the planet and loved our lives, but could no longer remember the way of them. 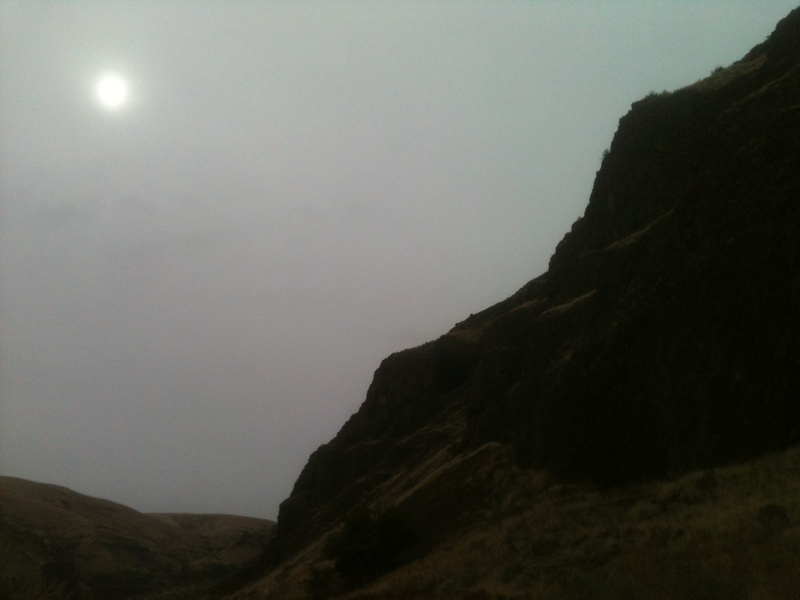 This entry was posted in Astronomy, Nature, Photography, Writing and tagged Cottonwood canyon, Dechutes, dreams, Futura Mission, john day, Samantha Cristoforetti, solar eclipse, sunspot. Bookmark the permalink.